No one likes a smelly car. No really, no one likes a smelly car. And the only reason you think your car doesn’t smell that bad is that you’re so used to the smell that it could smell like moldy cheese that’s been under a pig’s backside for a month and you’d go “eh, not that bad.” But if you could smell what your passengers smell in your car, then you’d have come by this list a lot sooner. So, with that said: car diffusers. Kicking off our list, we have the EconoLED Car Humidifier. If you’re looking for the most advanced car diffuser on the market, they don’t come much more advanced than this. And even when they do, we don’t like them nearly as much. So, what is it that got this entry to the top of the list? Let’s find out. The worst thing you can be behind the wheel is stressed out. You are driving a vehicle that can very easily end several lives with the wrong slip up at the wrong time, so you need to stay focused and relaxed, but alert. And the soothing, comfortable essential oils of this diffuser will lift your mood, relieve your tension, but not to the point of becoming lethargic. Just enough to help bring you back down to a more manageable mood. Dry air is not fun air to breathe. Human lungs love air with a decent amount of moisture in it, so if the air suddenly gets too moist or too dry, it’s immediately noticeable. And it’s not very good for concentration when all you can focus on is how dry the air is. 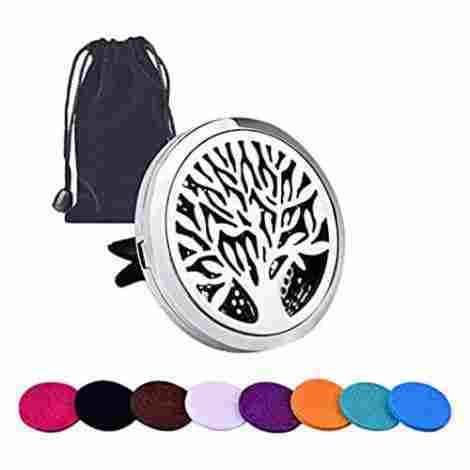 Fortunately, this car diffuser refreshes and moisturizes the air, along with giving it the fresh scent you expect from an essential oil diffuser. The great thing about car air fresheners is that they very rarely cost anything substantial. The price of this one might just be considered pricey to some, in fact, just by judging it by its contemporaries. Coming in second place, we have the Navy Penguin USB Aromatherapy Essential Oil Diffuser. The main difference between this and a lot of other diffusers on this list is that, instead of plugging into the cigarette lighter on your console, it actually plugs into the USB socket. And since there’s usually more than one of those in your car, it doesn’t inconvenience you at all. Of course, that isn’t the only benefit to using this. With some diffusers, you have to deal with the low hum of the interior fan every time you turn it on, which can get pretty annoying for some. Especially when you get the rare diffuser that is very loud with its operation. However, this diffuser is neither of those things. Instead, this diffuser is almost whispered quietly in its operation. Just loud enough for you to know it’s working, but very easy to tune out afterward. The great thing about being USB instead of being plugged into a cigarette lighter is that it opens up a lot more options for where you can actually use this diffuser. You can use it to relax your infant in their room, to keep you relaxed and focused in the office, and of course, in your car to keep the air nice and fresh. This diffuser is a fair bit more expensive than the previous entry, and this is to be expected, given the number of features it has to offer, and how versatile it is. But because of those things, we consider this diffuser to be more than worth the price. Finishing up our top three segment, we have the RoyAroma Mini Wooden Car Diffuser. Unlike a lot of the other entries on this list, this one is just plain old wood. No electronics or anything. 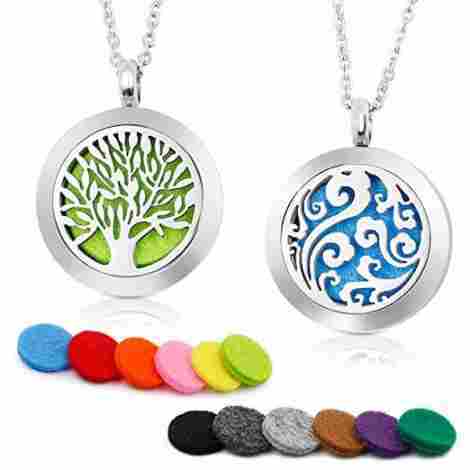 You take one of the included felt pads, drip a few essential oils on it, put it in the locket, and you’re done. So, let’s see what advantages this actually brings. If you have multiple people in the car, with multiple needs to charge their phones, then you probably don’t have room to spare for a USB diffuser. But fortunately, this diffuser won’t get in your way at all. Because it’s completely non-electronic, you don’t have to plug it in anywhere. Just put in the felt pad, stick this thing onto one of the fans, and you’re good to go. It’s the most idiot-proof entry on this entire list. But just because this works best when you put it on the car fan, doesn’t mean that that’s the only place and time you can use it. In fact, there are multiple places in which you can use this diffuser. As long as there’s a decent enough breeze going, you can pretty much take this diffuser anywhere you want to. The price of this diffuser is about the same as the first entry, which due to its non-electronic nature, some might find to be a rip-off. However, we find this diffuser to be quality enough to be more than worth the money. Coming in at #4, we have the RoyAroma 2 Piece Aromatherapy Oil Diffuser. At first glance, this may seem like the exact same thing the previous entry was going for, except this time there’s two of them. While true, they are made by the same people and thus share some similarities, there are actually quite a few things that set the two apart from each other. Got a pungent odor that no amount of spray air freshener will fix? Well no problem, because this diffuser doesn’t just suppress other smells with its own smell as some diffusers do. This one actually minimizes the presence of those other odors, making sure that its relaxing fragrance is all that your nose has to put up with. The fact that this diffuser comes in a set of two really is one of this product’s biggest advantages. Now you don’t have to worry about forgetting this diffuser somewhere when you want to take it for a drive. Just leave one in the car and take the other one with you when you aren’t driving. This one costs a little less than the previous entry, but not enough for it to be anything worth noting. The fact that there are two of these things is what gives it the price tag it does, and that’s good enough reason for us. 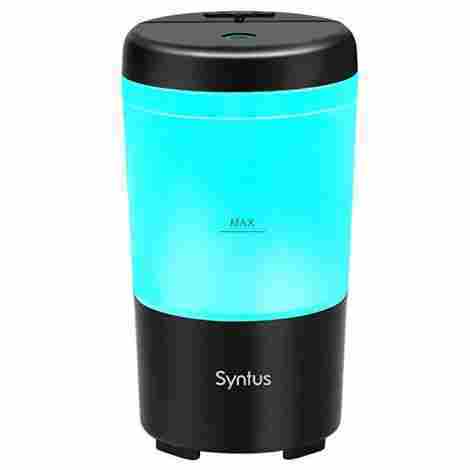 For our #5 spot, we chose the Syntus USB Car Essential Oil Diffuser. With this, we return to the usual formula of USB powered car diffusers. Like the last one, you can take this diffuser pretty much anywhere with you where there’s a USB port. Of course, there’s a lot more going on here that sets it apart from the rest. Spring is right around the corner, and you know what that means: pollen and lots of it. Besides making your pool look like the bayou, it’s also going to play havoc on your nostrils. Which is definitely something you’d rather not deal with when driving. Fortunately, this diffuser not only handles bad odors, but it also covers up and minimizes allergens in the air as well. 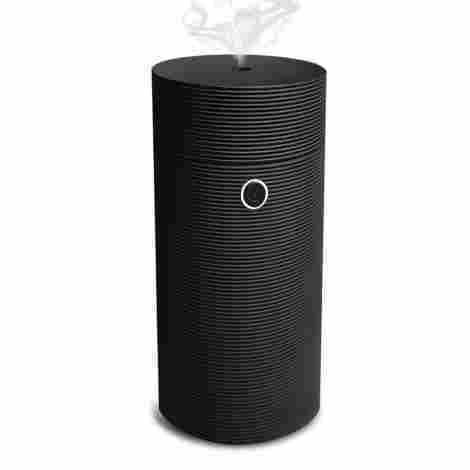 So, if you have allergies related to air particles, we can’t recommend this diffuser enough. You’re probably looking at this thing and wondering where you’re actually supposed to put it. Well, the answer is; your cupholder. There are a variety of other places you can put this compact diffuser, but from the design, you can guess where you’re primarily meant to put it. Don’t worry about plugging it in; it comes with its own cord that you can use. This diffuser costs a little less than the previous USB diffuser we covered, and just enough to keep it away from the pricey category. 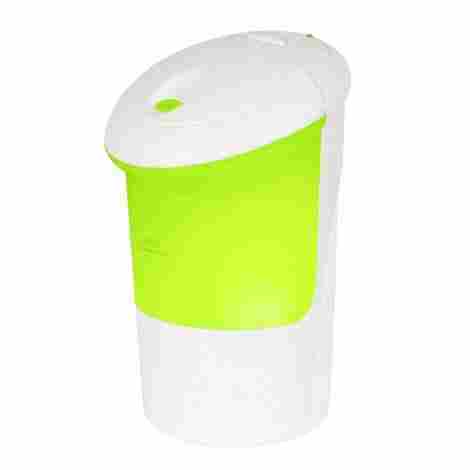 Coming in at #6 on our list, we have the ZAQ Tour Litemist Aromatherapy Car Diffuser. This is one of the smallest entries on this entire list, and unlike the other entries so far, this one runs on batteries instead of having to be plugged in anywhere. So, let’s look at this diffuser to see what advantages those two choices bring. Not only is this one of the smallest entries on the list, but it’s also the quietest on this entire list. This diffuser is almost completely silent, save for the very light hiss made by the air when it comes out, and you’re barely likely to even notice that. So, if you’d rather there be absolutely no noise coming out of your diffuser, then this is the one for you. Other diffusers we’ve covered so far run out of juice after about an hour or so. For some people, this is just fine, just enough time to get the entire cabin of the car thoroughly covered in oils, and the diffuser automatically turns off. But this diffuser keeps running for 4 hours before automatically shutting off, making it much better for those smells you want to thoroughly keep down. The main problem with this diffuser is its price, which is easily the priciest on this list so far. It isn’t the most expensive thing in the world, mind you, but by the standards set by this list, people are more likely to go after the other entries we’ve covered so far first. 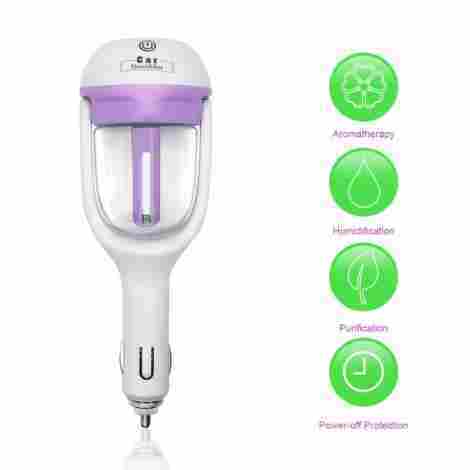 For the 7th place spot, we have the InnoGear USB Car Essential Oil Diffuser. Back to USB diffusers for this one, and this is probably one of the absolute best on the market right now. What is it that makes us say this? Let’s find out. Maybe you don’t want a constant stream of mist blowing into your car. Maybe you want just the occasional spritz to keep everything nice and fresh. Well, that’s where this diffuser comes into play. This diffuser has two different mist modes, which you can switch with just the push of a button. Whether you want a constant stream or an intermittent one, just push a button, and you can have either immediately. Driving at night, and the relaxing scent of the diffuser is starting to put you to sleep? Well don’t worry, this diffuser has a backup plan. One of the many features of this diffuser is a bright, multicolored LED light function that can help keep you awake during those late at night drives. This diffuser costs a good bit less than the previous one, but still enough to still be labeled as expensive by diffuser standards. Starting off our final three entries, we have the COSCOD Premium Car Aromatherapy Essential Oil Diffuser. With this entry, we return to the non-electronic diffusers that we went over earlier in this list. So, what does this one have to bring to the table? After all, it looks pretty similar to the first manual oil diffuser. Let’s find out. 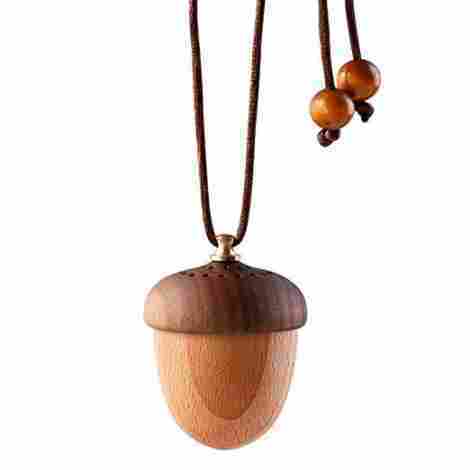 You’re probably looking at this locket looking diffuser and wondering how long you can expect it to actually stick around. Well, don’t worry about this diffuser, as it’s built to last. Made from a hypo-allergenic surgical grade 316L stainless steel, this diffuser isn’t going anywhere anytime soon. There’s one little problem that permeates through other diffusers on the market: the smell is too strong. The smell is often overpowering for people, hitting their nostrils like a freight train and not letting up. Which is why this diffuser is so focused on releasing just enough fragrance to be effective, but not so much that your senses get overwhelmed, and you can’t focus on the road. This is probably one of the cheapest entries on the entire list, and considering it gives you pretty much everything the 3rd place option did, that makes it a much better deal overall. 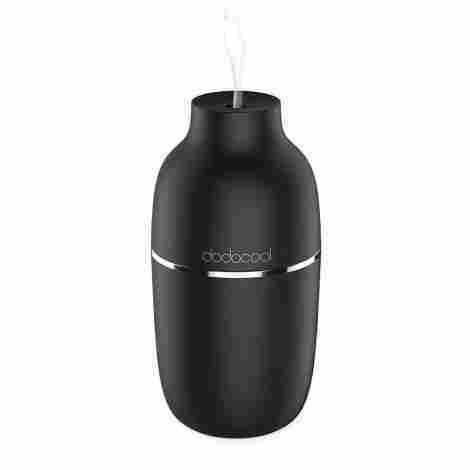 For our second to final entry, we have the Dodocool USB Humidifying Car Diffuser. Resembling an urn more than a cup, this diffuser nonetheless fits snugly into any cup holder in your car, with a decently long cord available for you to plug into any nearby USB port. 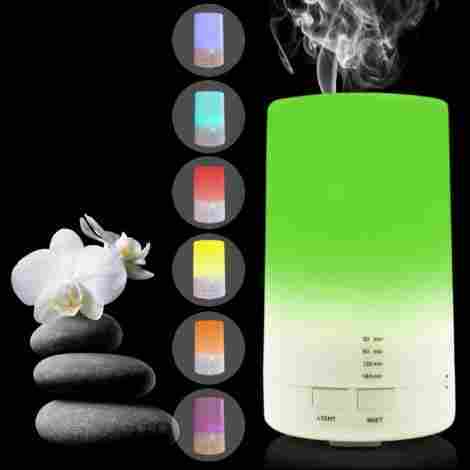 You can then enjoy the following benefits of purchasing this diffuser. With anything involving a lot of water, you want to make sure that said water is secured and not about to short circuit the thing holding it or leak out all over your car. For this reason, this diffuser is made with the main control circuit board, and the water cup as separated from each other as the tiny space of this diffuser will allow. Reducing the risk of an interior malfunction from water leaking out into the circuitry about as much as it can be. 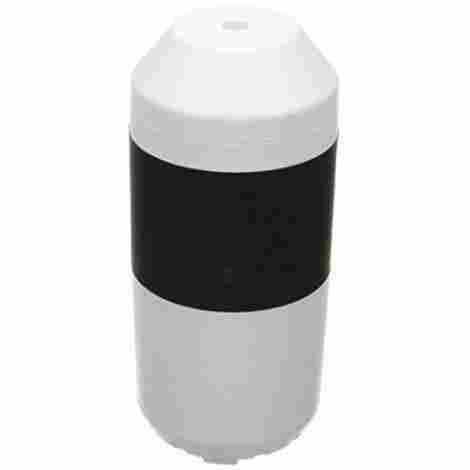 This diffuser can hold upwards of 180ml of water at once and use it to produce 30ml of moisture per hour. This diffuser is compact enough to fit into pretty much any cupholder you put it in, and the mist it generates doesn’t completely dissipate until about 100 square feet out. More than enough to fill your car with refreshed, moisturized air. We slingshot back in the other direction with the price of this diffuser, but thankfully the price isn’t quite high enough to be considered too pricey. For our final entry on this list, we’re looking at the Airror USB Car Essential Oil Diffuser. At first glance, one might just mistake this diffuser for a wireless mini sound bar, but closer inspection will reveal a diffuser that releases soothing peppermint mist into your car. You don’t want your diffuser to still be spraying while you’re out of your car, so it’s a good thing that this diffuser knows when to stop. When there isn’t enough water left in the tank, this diffuser shuts off automatically. Which is great for those who’d rather have as few drains on the car battery as possible. Not only is this one of the quietest diffusers currently on the market, but it’s also one of the most efficient with dispensing oil. This diffuser’s ultrasonic technology breaks down the essential oil and water into micro molecules as they’re released into the air. Once there, they get absorbed into the skin of the passengers, sparing you that oily feeling on your skin when you leave the range of the diffuser. Considering how advanced the technology used to make this diffuser is, we expected it to cost a lot more than it did. But sure enough, you can have one of the best diffusers on the market right now for a very fair price. Everyone wants their car to always be smelling the best it can possibly be, and when achieving that goal, you can do a lot worse than a car diffuser. A diffuser is one of the eco-friendliest ways you can freshen the air in your car. It’s just using a small device, whether electronic or otherwise, to spread essential oil into the air around your car. Improving the air quality, the scent, as well as the moisture in the air. All three of which are things you want to be at peak quality when driving. Bad air can throw you off of your game when driving better than a lot of other distractions, mostly because, and follow us on this one; we need air to breathe. So, if there’s something wrong with the air, your brain is going to label that as priority #1. Unless, of course, you have an air diffuser to get out in front of that problem. And if you’re looking for a diffuser to do just that, then we can’t think of any better than the ten we listed here. Mostly because we went looking and couldn’t find any better, but you get our point. If you want the best car diffusers on the market right now, find one of these that suits your fancy, and breathe in that new air. These are simple machines, and so coming up with a good list of criteria for evaluating who got on the list and where was a bit trickier than it normally is. However, by looking closer at each machine, and by asking ourselves what we would hypothetically want from such a device were it in our possession, we managed to come up with something cohesive. So, with that said, let’s get to it. The best kind of air freshener, in general, is the kind that you don’t even notice is there after you put it in. And one side of the coin that buys you such a luxury is the compactness of the device. This refers to how easy it is to find a spot for it, and fortunately, this is something that diffusers, for the most part, have down pat. There are two different types of diffusers: the kind you have to plug into something, and the kind that you have to clip onto the fan. The former is the kind that dominated the majority of this list since we wanted to cover electronic car diffusers for this list. Whether you’re using the kind that plugs into the cigarette lighter in your car, or the kind that needs to be put in the cup holder and plugged into a USB port, this is the kind most people nowadays prefer. And then there are the kinds you put in the fan. These are usually non-electronic, instead of using the air coming from the vents to drive the scent out into the car and relying on the shape on the cabin’s interior to help circulate the air. Either one of these is great as long as you get one of the items we featured above, which are the best. What this means is that some smells are stronger than others, and the stronger ones will always win out and overpower everything else. The smell of an apple pie, for instance, will almost always be more noticeable than the cleaner you used on your tile floor yesterday. Unfortunately, when you’re driving, you really don’t want any smells to be stronger than a light fragrance. Your brain considers the air it takes in to be a top priority because you can survive a car wreck, but if you take in bad air, then you’re really in trouble. So, if the scent of the diffuser is too strong, then it will override your other senses, and at worst, be so annoying and distracting that you find it harder to focus on the road. So, we looked for diffusers that offered a lighter, easier to manage scent that didn’t override everything else around you and get in the way of your driving. But as long as you’re putting new air into your car, that air may as well make itself useful, right? Around springtime, airborne allergens become the biggest nuisance for drivers with allergies all across the country. After all, it’s a tad bit hard to focus on the road and drive when your eyes are red and puffy, and you’re sneezing up a storm. Fortunately, there are many diffusers out there that, once they release the essential oils into the air, they also let loose some extra chemicals into the mix that proceed to suppress airborne allergens as much as possible. It can never get them all, of course, but the fewer allergens in the air, the less irritated you’ll be when you’re trying to drive. Not every diffuser offers such a service, however, so be on the lookout for it if this is something you want from your diffuser. In general, the fewer odd noises the things in your car make, the better. It’s all about maintaining your concentration, helping you breathe easier and relax better without adding more distractions onto the pile, undoing everything the actual oils are working to achieve. One of these minor annoyances is the noise made by the diffuser, which if you’ve ever used one that did make noise, you know is a low hum as the fan blows out the air. This refers more to the electronic variety of diffusers since non-electronic ones just use the already silent vents to provide the air. We scoured through each entry, making sure to track down the quietest ones we could find. The fewer distractions you have, the better the diffuser will be at doing its job. Our final criterion was the price of each entry. The great thing about diffusers is that their simplicity means they rarely cost anything substantial. The priciest entry on this entire list doesn’t cost nearly as much as some of the cheap options on our other lists. So, of course, we had to change our standards for what was affordable and what was pricey. But our usual philosophy remained the same: don’t judge by the price alone, judge by how well the product justifies what it’s asking for. And for a change, we had no problem in that area. For our final segment of this article, we’ll be looking at some frequently asked questions about car diffusers. Because these things are affecting the air in your car while you’re driving, it only makes sense to have a reservation or two about buying them. That’s where this segment comes in. The following are the most frequently asked questions about car diffusers, and the answers thereof. Q: Can these things trigger asthma or other respiratory problems? A: Used in excess, most definitely. But then, anything used in excess is bad for you. If you have allergies to certain airborne particles, you should particularly use a diffuser, or any air freshener, sparingly. Not to say you can’t use them at all, but the use should be limited. You should definitely be wary if you’re also a purveyor of scented candles and such. A lot of scented air for too long a time can actually cause respiratory problems. But as long as you keep good control over it, you should be just fine. Q: How long does a car diffuser last? A: it depends on the type of diffuser, honestly. Some last a good long while, others, a month if you’re lucky. We tried to find the ones with a decently long lifespan. For an electronic diffuser, you typically have a good year or so before the thing starts to wear out on you, like a lot of electronics these days. For a non-electronic one, such as the locket variety that uses felt pads, it all depends on how long the felt pads last. Some can be used over and over again, some have to be thrown away after one use, so it, again, varies from source to source. But generally speaking, a year is about the average amount of time you’re likely to be able to keep using a diffuser before it starts to slow down on you. Q: How can I make my diffuser last longer? A: Now this answer is the same no matter what kind of diffuser you have: just limit how much you use it. By using the diffuser only when you absolutely must, you extend how many times you’re safe to use it before it starts to slow down. Every air freshener out there has their own specific means of keeping the motor running for longer, and for diffusers, it’s to get your hands on an electronic one that has the option to spray out its contents intermittently, rather than continuously. This little change will actually keep the thing running at top speed for longer. Q: Is there any way I can make my diffuser use less water in its tank each time I use it? A: Not really, no. If you have an electronic diffuser that needs a water tank to produce its fragrance, then you’re at the mercy of how much water the tank in question can hold, and how much water the thing uses per minute. So, if you want that to be a little while, then you should check the length of time that each use lasts, which should be listed clearly on the box. But if you want to keep it going for even longer, you can always have a water bottle on standby for when it runs out. You find a rest stop, you fill it back up, and everything is right as rain. Granted this won’t always be the case, sometimes something more specific is needed, but this is generally how it works.